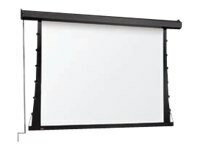 Draper Premier C Projection Screen, Matt White XT1000V, 16:9, 133"
The manually operated screen comes with a perfectly flat viewing surface. Its Tab Tensioning system delivers perfect picture quality and meets the exacting requirements of large-screen video and data projection. Series C are operated by a slim, polished aluminum crank, which may be detached for storage.